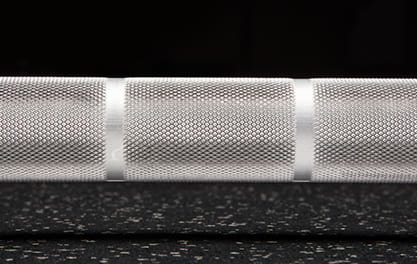 Fully machined and assembled at the Rogue factory in Columbus, Ohio, the T-15LB Technique Bar features a 28mm bare aluminum shaft with dual Powerlifting and Olympic knurl marks. With this design, we’ve also spaced the knurl marks at the same distance as an IWF standard competition bar, giving athletes the ability to maintain proper grip position as they progress from a light bar to a Men’s or Women’s weightlifting bar. A Tech Bar is most effective when it’s designed to prepare you for what’s next. 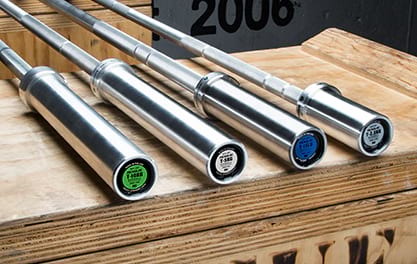 Whether you’re a young athlete using your first barbell, an amateur looking to safely practice your form, or an experienced lifter working your way back from an injury, the lightweight but quality-built T-15LB Technique Bar creates the perfect bridge for your progression to standard Oly and powerlifting bars. We have included two distinct sets of knurl marks, each set to International Weightlifting Federation standards for Olympic and Powerlifitng, respectively. 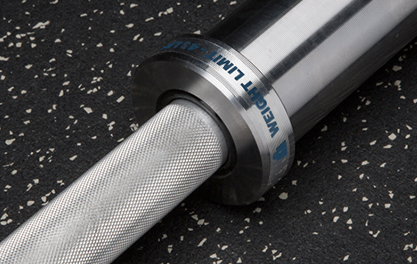 Our exclusive knurling pattern is precision machined for a firm but non-abrasive feel. The use of standardized knurl marks is vital to simulating the feel of a competition bar, so you’ll only need to adjust to the weight increase later on. The T-15LB Tech Bar is now fully machined and assembled in our Ohio plant, and includes an upgraded fit and finish with a more reliable spin and superior competition knurling. The 28mm bare aluminum shaft has a tensile strength of 42,000 PSI, and is paired with bright-zinc coated sleeves, offering a loadable length of 8”. Durable plastic bushings help maintain the smooth spin while keeping the bar light and manageable. 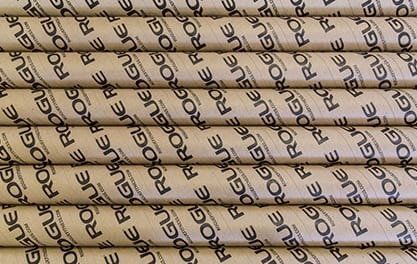 Rogue has long believed that our technique, beginner, and rehab bars should reflect the same level of quality and craftsmanship as any competition bar in our fleet. The T-15LB Tech Bar is part of a growing series of developmental bars we’re building in-house, including the T-2.5KG Tech Bar, Rogue 10KG Junior Bar, and the Rogue War Bar. Each has its own unique qualities and design specs to meet the specific needs of a wide range of athletes. The sleeves of the T-15LB Tech Bar are fully compatible with most standard size bumper plates, with a max load capacity topping out at 45 LBS or 20 KG. This bar is NOT built for for loads in excess of that amount, and athletes are also advised against dropping the bar when loaded. Rogue T-15LB Technique Bar is rated 5.0 out of 5 by 11. Rated 5 out of 5 by Twitch from I have 3 of these I train mature athletes (55+) and they use these bars every day. they're made solid, they look good and they give me a ton of training options I didn't have before I got them. Def worth what they cost. Rated 5 out of 5 by Jmitch from Perfect weight A recent purchase as my facility only had a 32# bella; I needed lighter. Lighter to work my overhead positioning without tweaking my shoulders. 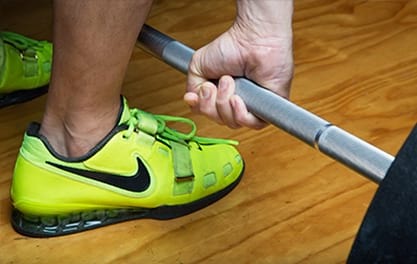 This bar has proven perfect as a teaching / technique bar. Rated 5 out of 5 by digger461 from Great little bar I bought this bar for my 10 year old daughter and she loves it. So far I am impressed by the quality of it. The biggest thing is that the weight limit is 45lbs so she has to switch to my wife's 15kg bar if she puts more than 15 pounds on each side. Other than that, good bar. Rated 5 out of 5 by Trapp89 from Excellent bar I bought this bar to train a female client, who had never lifted before. Being only 15 lbs but looking and feeling like a normal barbell, gave her great confidence and form. 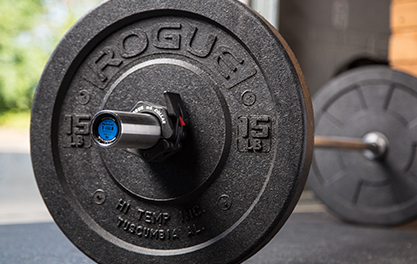 We use it to warm up on squats, bench and for the press. Rated 5 out of 5 by Henke B from Great quality Its perfect for technique training and warmups, and also a great starting barbell for kids. Rated 5 out of 5 by FTort from Best bar I have I'm a trainer and I have loads of clients that cant lift 45 lbs bars correctly. This bar allows those clients to practice the big lifts with a bar that's regulation grip girth and fits in a squat cage. Use it EVERY **** DAY. Great investment and a must have for serious trainers and lifters. Rated 5 out of 5 by ScottJM from Great Beginner Bar for kids, Elderly and females Super sturdy. Super light. Great bar for introducing newbs to pressing, pulling, and squatting. You can instruct movement patterns very nicely without scaring the lifter or making them sore the next day. Also, the knurl is downright FUTURISTIC on this bar. 10/10 rogue!! Rated 5 out of 5 by lineman from quality bar Quality bar, good knurling(identical spacing and marks as my rogue bar) and wide enough to easily rack in an S2 squat stand. Perfect for lifters that require a bar lighter than 20kg.